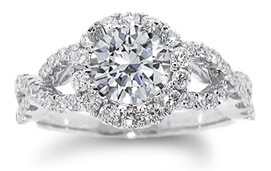 At Jasmin's Jewelry we offer thousands of unique ways to symbolize your enduring love. 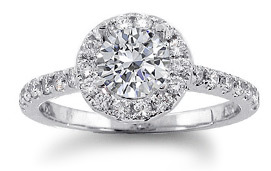 Although each engagement ring we carry is uniquely different, most engagement rings created today fall into several specific designs. 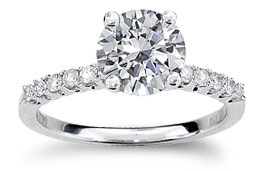 Below you'll find a few of the more popular egagement ring designs. 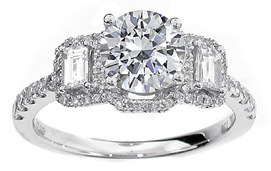 Visit our jewelry store in Encino, California to shop our large, unique selection of fine bridal rings in person. The timeless classic! 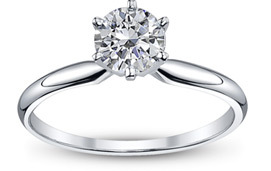 We offer diamond solitaire rings in all precious metals with 3,4,5 and 6 prong settings. Past, Present and Future side by side are all represented on this modern classic design. One large diamond is surrounded by two smaller diamonds set on opposite sides. This stunning, relatively new style of engagement ring features a single row of round cut diamonds, pave set around the center stone. Split shank engagement rings feature a band that branches out into two or more strands as it reaches the crown to further accent the center stone. 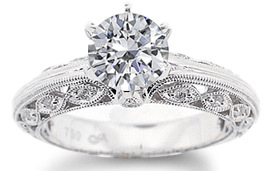 Antique or vintage style engagement rings feature hand etched and engraved floral embellishments on the sides of the band. 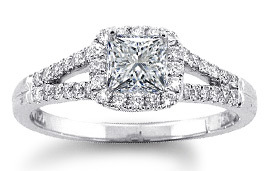 Infinity style engagement rings feature a single band that splits into two overlapping smaller bands. Straight band engagement rings feature a single unbroken shank that can easily be stacked to sit flush with a matching band.